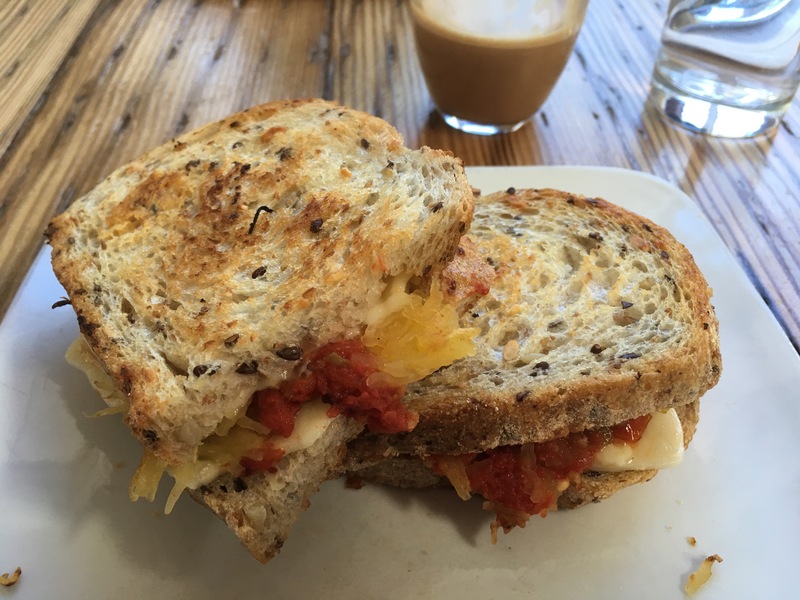 Cheapside Cafe Downtown – Go There. Try That. Cheapside Cafe is one of those restaurants that’s been on my list for awhile. 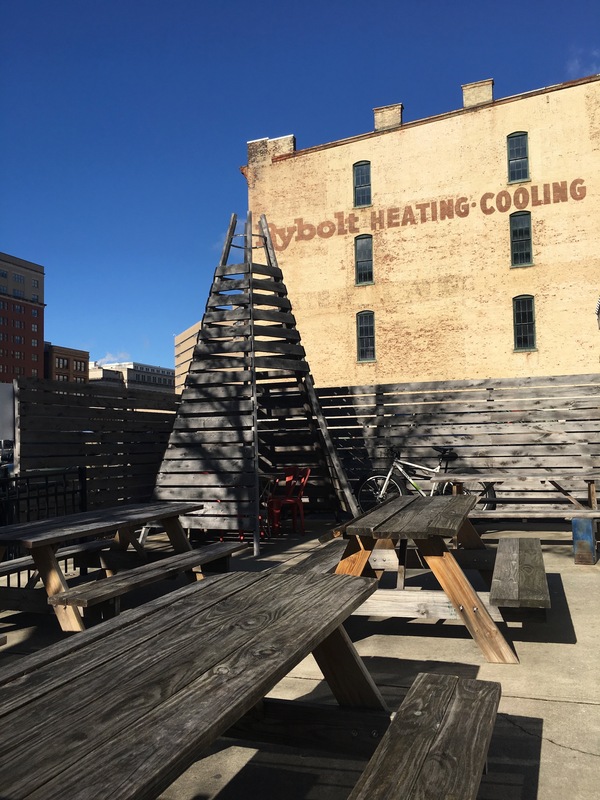 If you drive around downtown Cincinnati very often, you might have spotted this corner restaurant with the teepee outside. 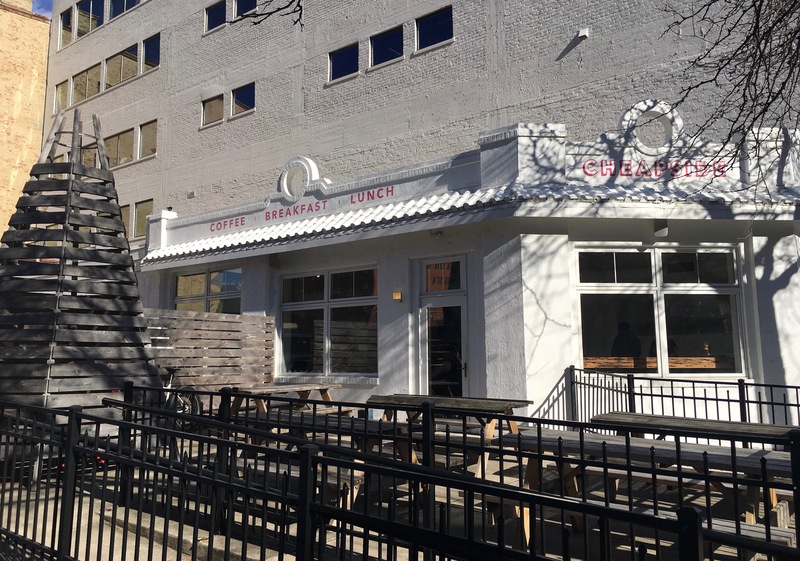 Cheapside Cafe, sitting on the corner of E. 8th Street, offers a strong breakfast and lunch menu. Although small, the restaurant is bright, light, and clean. The white paint and wall of windows works nicely with the natural wood finishes. Considering the number of customers coming in for takeout orders, Cheapside’s location makes it convenient for downtown employees to get fresh and filling food! This place is hopping! Cheapside gets their coffee from Wood Burl Coffee, a roaster in Dayton, Ohio. When good coffee meets good food, it’s a beautiful relationship. 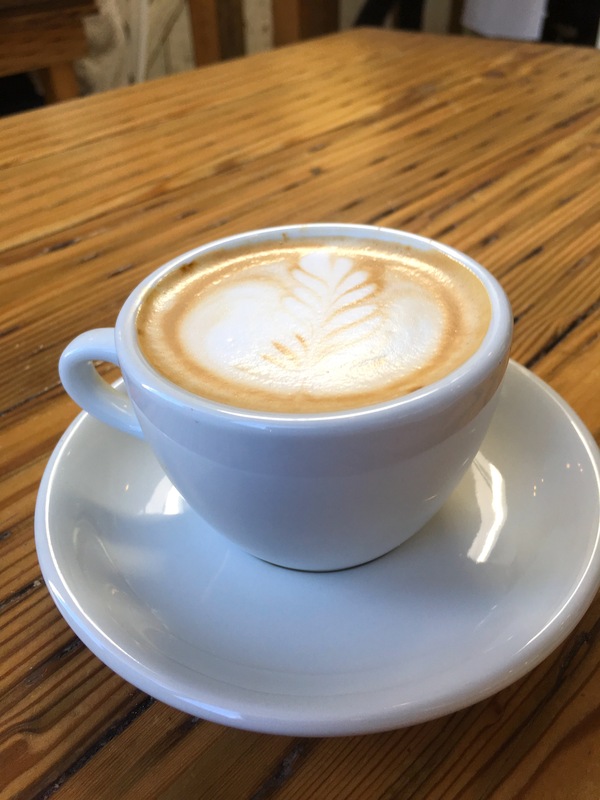 Cheapside offers drip coffee, pour over, and cold brew for the traditionalists as well as everything from a cortado to a macchiato for those who prefer something a little fancier (or sweeter). It was a chilly day so I went for hot coffee, but I saw someone order the cold nitro brew and I was so jealous! The menu at Cheapside Cafe is small yet original! The portions are generous without going overboard. Diners peruse the menu posted on the wall just inside the door, place an order at the counter, and find a seat. 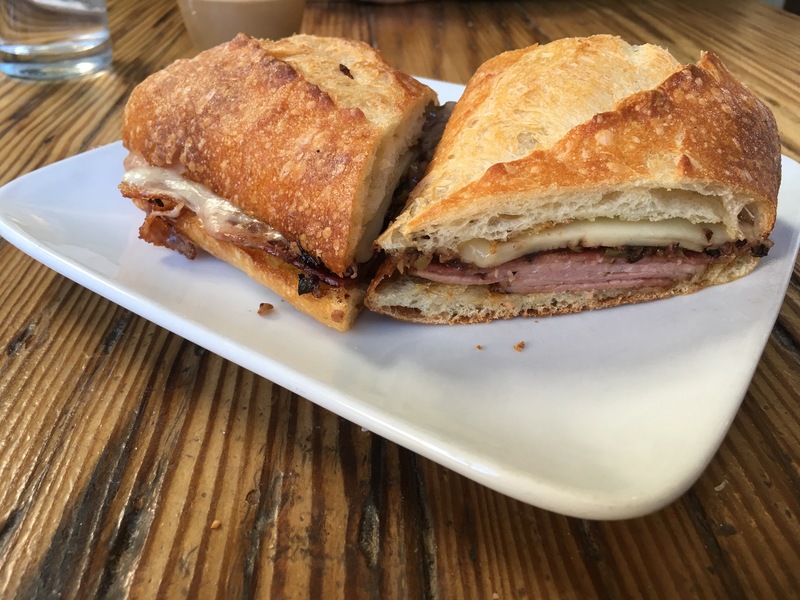 Sandwiches are the scene stealer at Cheapside. Served on Sixteen Bricks bread, these sandwiches are perfectly grilled and perfectly balanced. We had the Mufaletta, the Chorizo Egg, and the Grilled CHZ. The Chorizo/ Egg is not for the faint of heart. 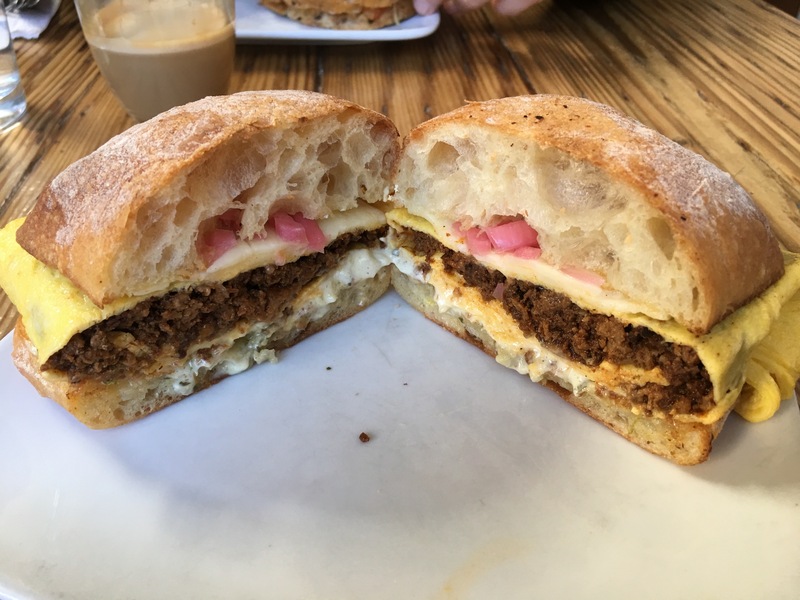 With plenty of spicy chorizo and egg packed inside ciabatta bread, this one is hot and delicious. I devoured it! My favorite, though, was my husband’s Grilled CHZ; this was a surprise because if I had known what was on it, I might not have even tried it. One of the main components is spaghetti squash? What? And it works. Spaghetti squash, slow roasted tomato, green chile, and cheddar on multigrain bread. It’s all melted, gooey goodness. While we were eating, we saw tons of Curried Chicken Salad sandwiches going out so I definitely need to try this one soon. The fact that Cheapside has Spicy Garlic Pickles on the menu made my day. Pickles are my favorite food. No joke! I’m a pickle enthusiast of sorts. 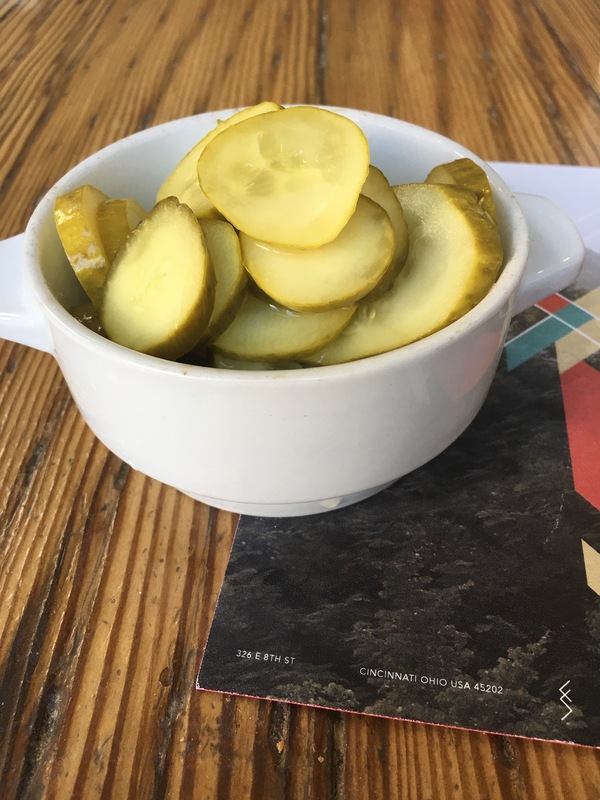 These dill pickles at Cheapside are crunchy, crisp, and not too spicy. So. Flipping. Good. Nice spot for warmer weather! I feel like I would be remiss if I didn’t mention the customer service issue at Cheapside. The food was incredible, but the service left a lot to be desired. I’m hoping it was an off morning. It was strange because the staff barely smiled and asking a question was difficult because no one really stopped by our table. To be honest, I felt like I was intruding. Again, maybe it was a weird morning and this is not the norm. Now, will I go back? Yes! The food is fresh and worth it. 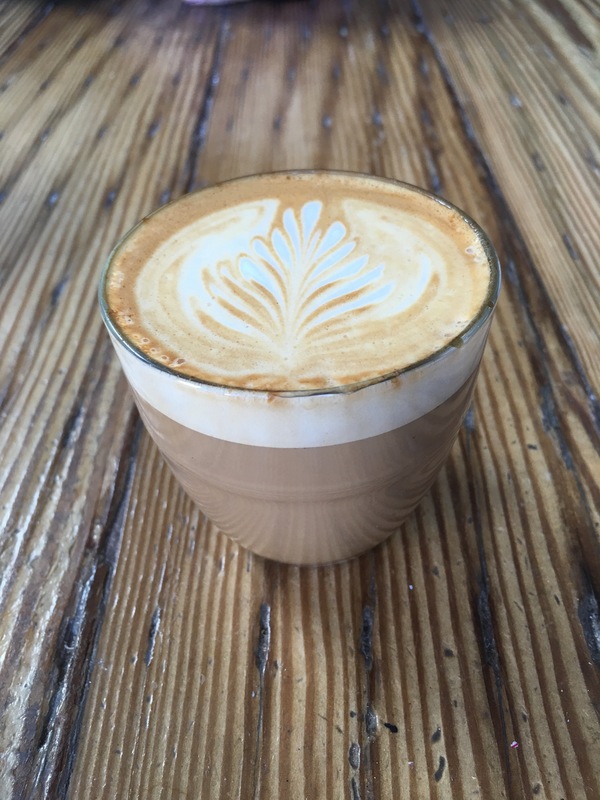 Hours: Monday through Sunday open 7am to 3pm. GO THERE (Cheapside Cafe)! TRY THAT (Chorizo/Egg, Grilled CHZ)! That’s a bummer that the service wasn’t the greatest…but that food does look good! Hopefully next time will be better!